Project Online provides many powerful reporting tools and is a treasure trove of information. However, many organizations have other data sources that affect or otherwise influence the data from Project. It is common to have other internal or external data sources that, when combined with Project data provides a richer source of information. While the core of the data might be from Project Online there may be other data sources that can be combined to present a fuller portrait. This presentation is about setting up Project Online to have the right data but then about combining that data with other data sources into a visual dashboard. This can make decision making a bit easier as decision-makers don’t have to look into one system for one set of data and another system for another set of data and then combine those in their head with scheduling data. With the data combined into one dashboard all the key metrics from all of the systems can be used together. Collin Quiring is the Managing Partner of EPM Strategy and has over 20 years experience in project management, resource management, product development, systems administration, reporting and training. Mr. Quiring is a technical expert in Microsoft Project, Project Server, Project Online and Power BI. He has worked with all aspects of the tools from installation to configuration to daily administration, and holds the PMP, OPM3, MCTS, MCT, MCP, and CIRM certifications, along with an MBA. Contact Collin at cquiring@EPMStrategy.com. How do I cause the PowerBI screen to be refreshed when new data is uploaded to PowerBI? I am seeing the same data like when I just setup the content pack. I tried the simple refresh on the menu but that is not working. 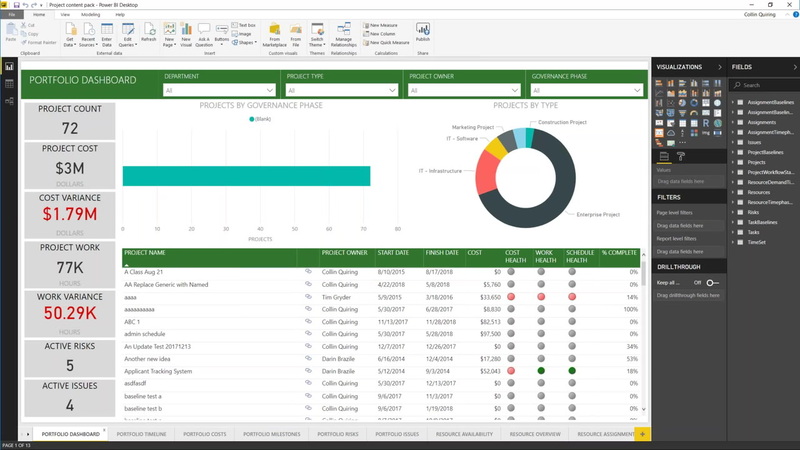 When the originating data changes, selecting the Refresh from the ribbon in Power BI will refresh the data. When you say that it is “not working” can you better define what you expected and what you got? I have deleted some projects in project online and clicked on the “Refresh Dashboard Tiles” in PowerBI and I am not seeing a change in the project count. I am wondering about a few things. The first is the browser you are using. Some browsers do not give an error message, they just don’t do anything when you hit the “refresh” buttons (or most of the buttons). So, first thing I would do is try this in another browser. Another option is that sometimes from the time you hit refresh until the time it actually refreshes is up to 15 minutes. I suggest that you put in the refresh time on the pages in the dashboard and use that as a guide. Third, do you have permissions to refresh the data? If so, what happens if you go to the report and refresh? Does the data change there? If it does, then maybe the dashboard and the report page(s) that the dashboard came from originally are no longer in sync (for example, the type of visual could have changed). Let me know how that works out for you! Great means of showing flexibility but was hoping for more of “how it’s done” within the presentation. Was a good presentation but was expecting more on how it is set up between project and BI. I tried IE and Chrome but no change. I tried “getting” the service again and the data was refreshed. How exactly should I be refreshing the data, perhaps this may be the challenge. In the service (the browser), there are a few options. In my mind, the best way to do this is to set the Schedule Refresh from the Dataset. That way, it updates automatically. The catch here is that it may depend on if you have/need a gateway. If you don’t need one, great! If you do need one, but don’t have one or can’t make one, then just selecting “Refresh Now” from the Dataset should work out. Just click on the elipses next to the name of the dataset and select Refresh Now. The second best way is to select the Report and then at the top of the screen, select the “Refresh” option in the ribbon. The third option is less productive – you can go to the Dashboard, select the elipses in the top right corner of the web page (NOT the top right corner of the dashboard page) and then select “Refresh Dashboard Tiles”. Hi Lloyd – do you think a separate webinar would be in order for the “technical how to” for getting Power BI to talk to a few different Project sources?